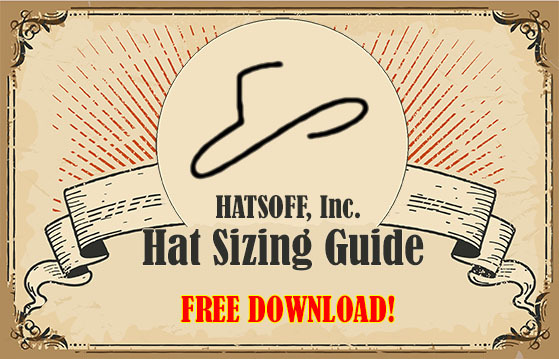 Always be aware of proper hat care to keep your hats looking and feeling good! Keep hats free from dust. If a hat is dusty, a drop of water will make a mud spot that will soak into the material and be hard to remove. A soft bristle hat brush is better than a whisk broom or ordinary clothes brush for a good felt hat. Always brush with the nap. Ordinary dust marks may be removed by rubbing with a rubber cleaning sponge obtainable in most hat stores. If a hat gets rain-soaked, push out the creases and dents, get it as even and round as possible, and if the brim is turned down, turn it up again. Turn out the leather. Now stand the hat on the leather, on a clean, level surface and leave it there until it dries out naturally. Do not use artificial heat. Pressure of any sort on the soaking wet hat will leave its mark when the hat dries. Don’t jam the brim up against something or it will buckle while drying and will stay that way. Turning out the leather after a perspiring day preserves the life of a hat. With the leather turned out, perspiration and hair oil evaporate and dry out instead of being transferred to the hat. This also applies to straws. Never rest a hat on its snapped brim for any length of time, particularly a light-weight, and particularly if the hat is wet. Weight of the hat will cause the brim to buckle. Turn up the brim before resting it on a table or shelf, or let the snap extend beyond the edge. A straw hat can be kept clean and fresh-looking much longer if it is brushed regularly with an ordinary whisk broom. If a straw hat gets wet, first wipe off the surplus water with a clean dry cloth. If worn with brim down, turn the brim up, turn the leather out, and place on a level, clean surface to dry. When a hat is not in use for long periods (between seasons), store it in a hat box if possible. Never put a hat (whether straw or felt) on a radiator top while the heat is on. For winter storage, keep fine Panamas and other body hats in a cool place.